Why do you play video games? Is it to relax and ease into familiar systems that, through continued play and experience, you come to understand and potentially master? Is it to be challenged by systems you wouldn’t normally see in your day-to-day life? Is it to overcome and adapt to what may initially seem impossible? If you aren’t familiar with this whole “Dark Souls” phenomenon that has been going on, allow me the opportunity to inform you on the subject. Dark Souls was FromSoftware’s spiritual successor to their own Playstation 3 exclusive Demon’s Souls – both titles taking inspiration from the older King’s Field series – their primary features being action-based combat systems and unforgiving difficulty. While many would argue that the nature of Role-playing games, with their emphasis on gaining experience and permanent progression systems, is one that discourages the label of “difficult,” the Souls series subverted this by making its experience a resource capable of being lost. Players needed to choose their route of travel as well as manage their resources carefully, as pushing into the game world too aggressively could result in losing their experience. Although these games also allow a single opportunity to reclaim lost experience, this chance can more than often slip through players’ fingers as they fall to the same or similar hazards as the first time. The success and acclaim that came with the Souls series spawned a number of titles attempting to imitate its mechanics in different ways. As “lives” systems had lost relevance in modern gaming, the threat of losing potential progression offered a new and unique twist that can be found in platformers like Shovel Knight and other contemporary titles. However, many Role-playing game developers would also use the positive reception of these difficulty-altering philosophies, as well as the new appreciation for action-combat systems, to create games with very similar design and formula to the Souls games. With that as an introduction, one should read all of the following review of Salt and Sanctuary with this knowledge in mind. Salt and Sanctuary is what could easily be described as a “2D Souls Game,” although assuming it takes all of its design cues from FromSoftware’s infamous series isn’t quite right. In truth, much of the interconnected nature of Dark Souls’ world was reminiscent of Metroidvania titles like Super Metroid and Symphony of the Night, and although using keys would be a major method of opening up looping paths, the main difference was that the player received no permanent upgrades to their mobility or combat options that allowed them to explore new places. Salt and Sanctuary differs from Souls and embraces the Metroidvania idea in this regard. While there are a number of save points scattered throughout its labyrinthine island locale that must be activated and built upon in order to become truly safe hubs, there are also permanent traversal options gifted by pushing further and further into the game world. The journey towards the narrative conclusion and endgame is peppered with a number of enemy encounters, some fast-paced and melee oriented, others ranged and magical. A number of required and optional boss encounters stand guard at varying intervals, each possessing unique mechanics and attack patterns. The player must rely on their avatar’s tools, their own reflexes, and an understanding of the world design in order to achieve victory. With a light and heavy attack input, defend and dodge-roll options, and several quick-select inventory slots, the player must use the predispositions of their unique player avatar’s starting class in order to tackle the melancholy horrors of Salt and Sanctuary’s expanse environment. The exploration in the game is helped by a great deal of variety in environmental design – some areas feature lifts, high towers, and vanishing and crumbling platforms. Defeating enemies grants the player Salt, a valuable resource used as experience for the player’s own skill tree, as well as a means of upgrading or transmuting equipment. However, just as this resource is key for tackling new challenges, it is also lost when the player is killed – either tied to the specific enemy who dealt the final blow, or in the case of a death by environmental hazard, materializing as an ethereal creature that thankfully spawns at the last safe footing the player had before dying. The player can then reclaim their lost Salt and attempt to return it safely. If a player is experienced with the Souls formula, there are aspects of Salt and Sanctuary that will feel very familiar. The gameplay loop of gathering Salt via defeating enemies is one that becomes exponentially more confident – although the player may feel daunted by each new environment, they can either push their limits by attempting to reach the next Sanctuary, or they can continuously double back to heal and inch ever further. The latter strategy is usually best, however, if only because Salt and Sanctuary has a few very oppressive enemy types and environmental hazards that can decimate an unprepared player in a matter of moments. Frequent traps, hoards of flanking enemies with unblockable attacks, as well as the combination of both can either force a tentative gameplay tempo, or a hyper aggressive, opportunistic play style. There are a number of button combinations the player can input with their light and heavy attack options that can result in different animations and increased damage, though these also come at a risk – the more committal an attack animation becomes, the more likely the player cannot avoid taking damage from similarly aggressive enemy types, of which there are many. As both attacking and defending options reduce the player’s stamina bar, prolonged skirmishes are either a series of hit and run tactics, or rely heavily on very safe, defensive play. Although some attacks can cause enemy types to stagger or interrupt their attack animations, there is no particular indication of which combinations can achieve this, and experimentation is something that needs to happen early on in a playthrough so that continued failure does not become the norm. It is a bit unfortunate, then, that Salt and Sanctuary slows its own pacing by discouraging experimentation in its opening moments. Players choose both a combat class and a Sanctuary affiliation at the start of the game, and although they can save, level up, and distribute skill points at any Sanctuary, they can only summon useful NPCs to Sanctuaries matching their affiliation. When the first three Sanctuaries outside of the starting area are of varying affiliations, it means the player must either ditch their current oath and take on a new affiliation, thereby locking out NPC summons to other Sanctuaries, or limit themselves to NPC summons at the starting area and potentially one other Sanctuary, depending on the chance that their beginning affiliation matches one of these first three. NPCs allow the player to complete quests for extra healing items, the ability to sell a multitude of superfluous equipment that will pop up along their travels, upgrade or transmute their current loadout into something better, or fast-travel to other Sanctuaries (an ability that should admittedly be saved for after the opening moments). Without their presence, the player can only level up, or save their Salt for its use later on – a notion the aggressive and unforgiving enemy and environmental design inherently contradict, as they frequently result in deaths that negate a great deal of Salt accumulation. In other words, the opening of Salt and Sanctuary is difficult. But perseverance beyond the opening hours – and opening series of bosses – will grant the player the first of their permanent movement upgrades, a substantial understanding of how the game’s systems and environment, and the mental fortitude to take on the next series of challenges – which tend to fluctuate from difficult environments and less aggressive enemies, to more straightforward looping paths and brutally hard boss encounters. The amount of variety present in Salt and Sanctuary means the player will always feel a sense of discovery and uncertainty, and with this comes a constant – and refreshing, depending on one’s taste – sense of oppression. Salt and Sanctuary is presented in a 2D plane with hand-drawn sprites and animation, and similar to the Souls series, its art style leans towards the macabre. There’s plenty of blood, grotesque character design, and murky architecture to be found. While this pairs well with its grungy OST and ambiguous setting and narrative, its slightly stylized player avatars are more cartoonish than most other designs in the game, which comes across as a bit goofy. Considering players will find themselves coated in armor before long, it is not a major detractor. The main objective of the narrative is to reclaim the Princess bandits have robbed while the player was traveling at sea, but the nature of the island the player must explore is slowly revealed in all of its horrifying glory, warping goals and justifying the strange purgatorial vibes the entire place gives off. Many items possess flavor text that help give a bit of character, but for the most part, the lore in the game is rather light, and the majority of the game is spent in exploration and combat. Unless players go out of their way to find lore compilations and deep dives in terms of narrative, the story will rarely get in their way or manage to emerge. While this may be best for gameplay purists or those who do not value story, there is also something to be said for the game’s aesthetic consistency. Bosses are given context within their respective realms, the areas themselves are given the proper enemy types and gimmicks that add to their personality. Overall, the presentation of Salt and Sanctuary is literally and figuratively dark, but it comes together to enhance that previously mentioned aura of oppression. Of course, the word “oppression” is a weighty term. If a player should find a game being described in such a way daunting or off-putting, then it might be best to re-evaluate taking a look at Salt and Sanctuary. There are many moments where a hefty chunk of progress can be stripped away simply due to a misstep or miscalculation, and the highly aggressive enemy behavior can overwhelm and make progression slow to a crawl. I have spoken with several fans of Souls titles, many of whom expressed excitement and anticipation regarding playing Salt and Sanctuary after hearing my description. Even simply equating the game to the Souls series is somewhat disingenuous, however, as it also possesses blood and character that can be found in many other titles. My own play experience, having never played a Souls title and instead feeling far more seasoned in Metroidvanias, has been mixed. On one hand, the permanent traversal upgrades and NPCs help add a bolstered sense of progression to the game and give it a satisfying series of travel loops that turn the sprawling island into a far more manageable obstacle course, but on the other, there have been a number of times where roadblocks, hardly-telegraphed traps, and brutal bosses have stonewalled both literal progression and that of my player avatar. 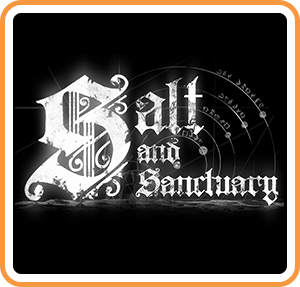 Perhaps a saving grace to this difficulty is that Salt and Sanctuary has a surprising co-operative feature, where two players with save files and avatars can join a game locally and explore the island locale together. While its a far cry from the Souls series’ online invasions and co-op, it is still a nice option that can make the whole experience more manageable. However, two player characters with their own skill trees means that players need to be prepared for the long haul and plenty of co-operative time. Should one not have an extra and very closely-scheduled friend, there are the numerous bottle messages players can litter around the island with helpful (or trolling) advice. Recommending Salt and Sanctuary comes with a hefty amount of baggage. It is not just an action-combat RPG, it takes some of the best parts of a number of different series and combines them to create what could be called a 2D Dark Souls equivalent. However, that is a discredit to all of the smart design and punishing challenge the the developers have implemented in order to make that oppressive feeling work without an additional dimension. A patient video game enthusiast with some experience with this kind of game may get the most mileage out of it, but even newcomers will appreciate the crash course of mechanics and difficulty that Salt and Sanctuary features, especially with the fabled Dark Souls remaster eventually coming to Switch. If you’re looking to get your teeth kicked in by a well-made title, this is definitely the one for you, otherwise you might end up grappling with your Switch a bit too much.